The Perfect Match for the Goal of Audience Engagement? The recent announcements of both the partnership between Sony Music and Chelsea FC and the Paris Saint-Germain collaboration with the Rolling Stones seemed to indicate a new frontier in the Entertainment world - powerful music and soccer crossovers which have the potential to engage audiences who love both the beautiful game and their tunes. 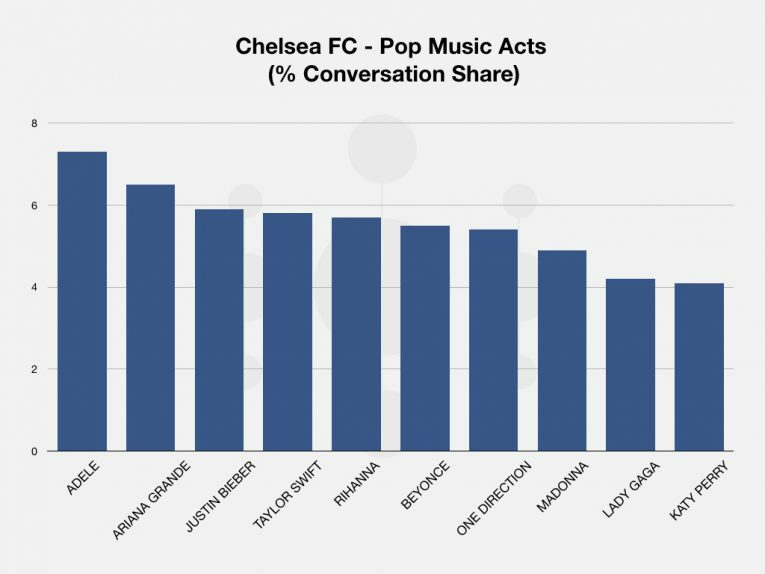 This intersection between Music and Soccer is a major area of interest to us here at EntSight and so we decided to use our data skills and tools to explore how, in the case of the Sony and Chelsea FC partnership, this new collaboration could best be activated to impact audiences most effectively. First up we segmented an audience of UK Chelsea FC fans using Global Web Index and examined their music behaviours and preferences. Analysis of the audiences live music habits made something abundantly clear - they are very keen on live shows and events, over indexing in this area by a fair degree in fact. This strongly suggests that there is an opportunity here for Sony to utilise this and develop live events featuring their artists in partnership with Chelsea FC. Our thoughts on this are that this interest in live music could mean an opportunity to make use of Stamford Bridge as a venue for exclusive shows for Chelsea fans featuring Sony artists – potentially during the Summer when both the labels artists are touring the festival circuit and the ground sees less use. 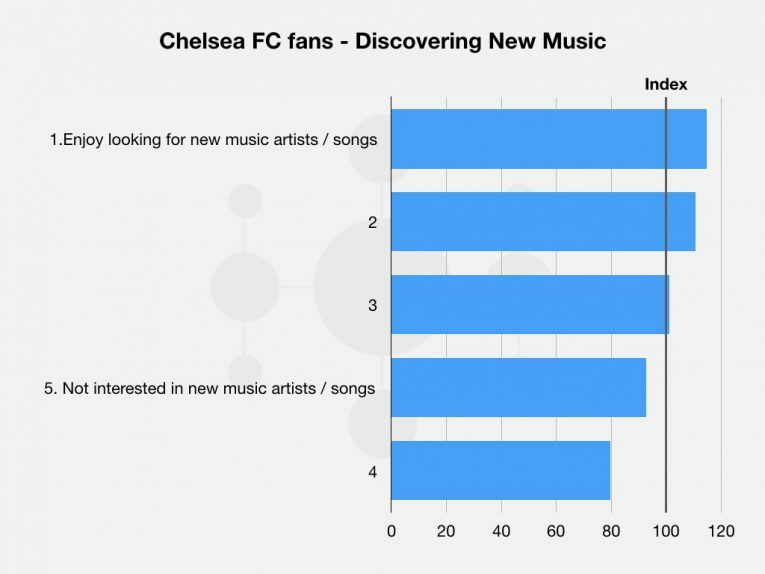 The Chelsea FC audience also demonstrated a preference for finding new music, suggesting that they would be open to being introduced to new and up and coming Sony artists via this partnership. 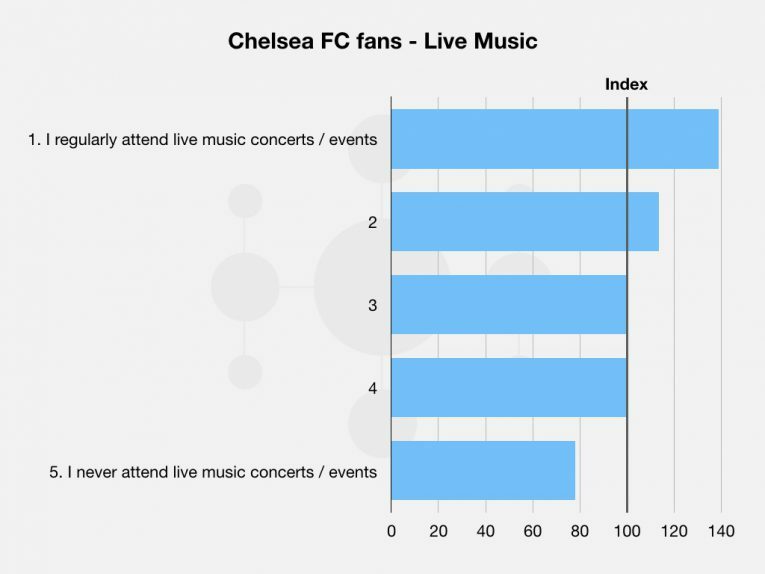 Perhaps another option here could be after game shows at the clubs ‘Under The Bridge’ venue featuring up and coming Sony artists – given the data suggests that Chelsea fans could well be receptive to this. 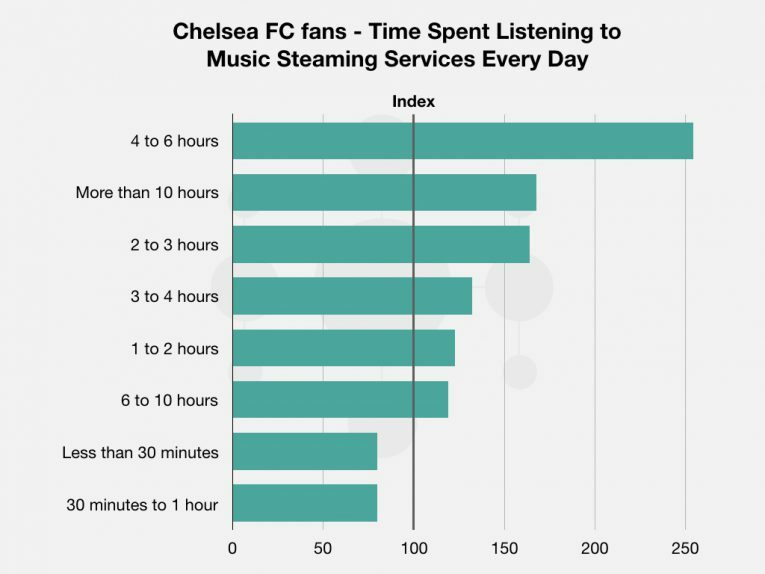 We also analysed the time this Chelsea FC audience spend listening to music streaming services and discovered that they are likely amongst the heaviest users, with 4 -6 hours a day being the most prominent usage category. 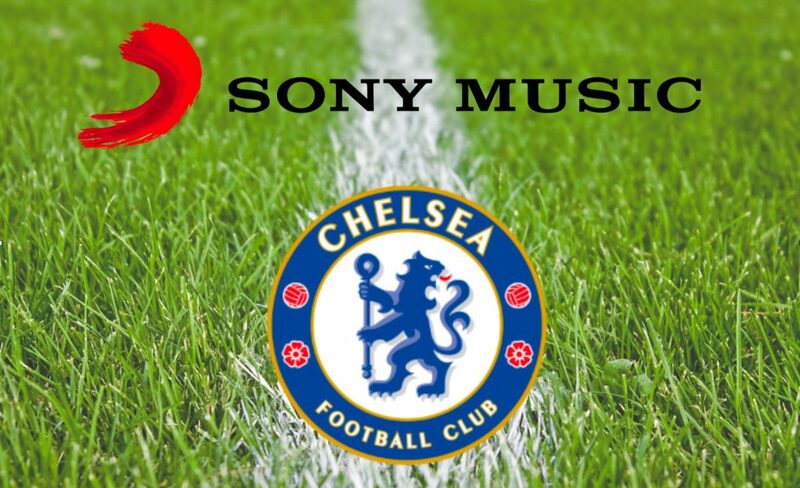 Given this exposure to the likes of Spotify and Apple Music it makes sense that the new partners have already announced plans for Chelsea players to curate a special Sony Music playlist for the club’s supporters. 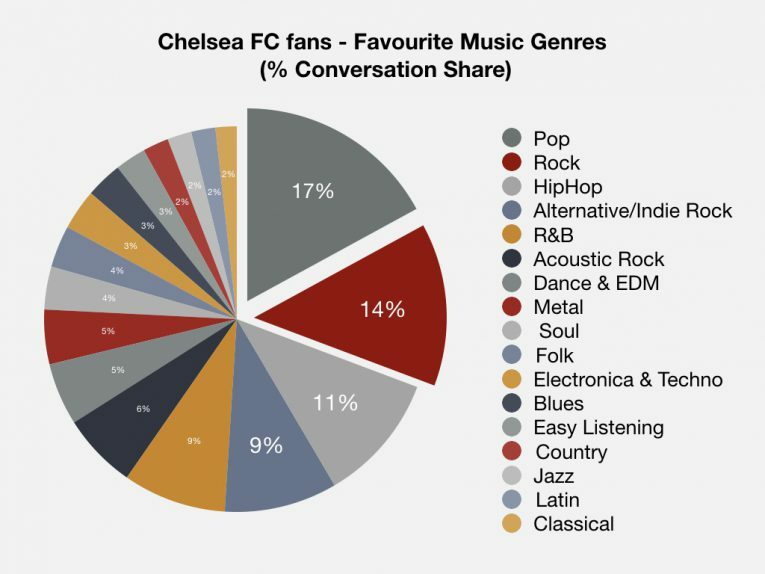 Using our unique Constellation tool we analysed Chelsea FC music fans based on their social media conversations to identify the genres and artists they favour the most. Pop music and Rock saw the largest shares - followed by Hip Hop and Alternative Rock/Indie. This is especially significant as Rock and Alternative/Indie saw above average shares of interest here compared to what we usually see for U.K. audiences - suggesting Chelsea FC audiences have a strong affinity with these genres. 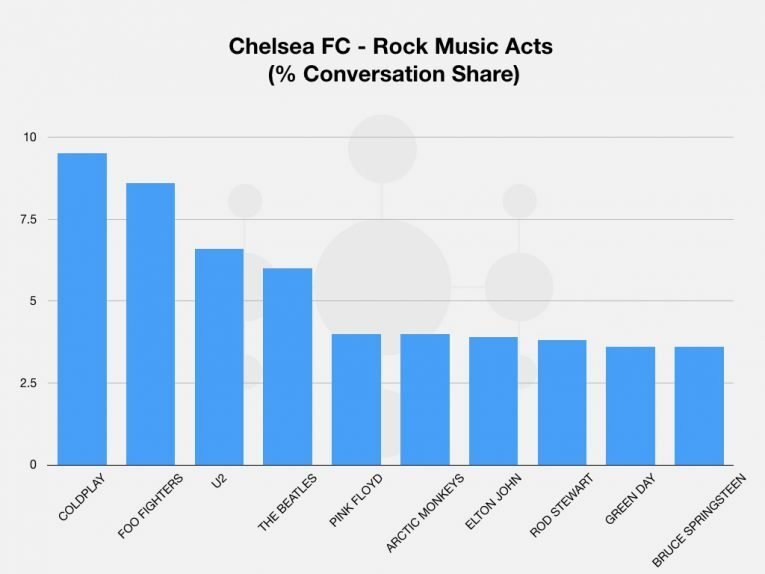 Given this Chelsea FC’s audience interest in Rock we looked at the artists that were most prominent in their social and online conversations. Coldplay saw the most interest overall here however it was Foo Fighters, a Sony act, who were nearly as popular here and so would certainly be a strong choice for helping activate this new partnership - perhaps through a live event. Analysis of favoured Pop artists confirmed Adele, also a Sony act, as the most popular, whilst other label acts performing well in this category included Beyoncé and Madonna. We're looking forward to seeing what the Chelsea FC and Sony Music partnership delivers, but in the meantime we at EntSight hope you've enjoyed our demonstration of how audience intelligence can be used to inspire and inform powerful, relevant activations.